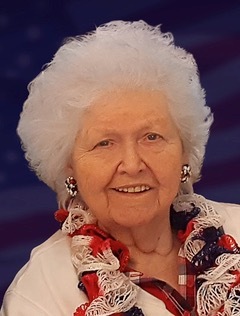 Hagerstown, MD – Dorothy Martin “Dot” Waters, 90, formerly of Downsville went to be with her Lord and Savior, on Tuesday, February 5, 2019. She was born on July 4, 1928 in Hagerstown, MD to the late Lester Henry and Vera Kathryn Downs Martin. Dot graduated from Williamsport High School in 1946 and from Columbia Business College in Hagerstown, MD. Dot worked at the Board of Election Supervisors of Washington County for 30 years and served as an Election Administrator until retiring in 1991. She was a 50 year member of the Downsville Christian Church and a member of the First Christian Church of Boonsboro, MD. Dot enjoyed traveling, playing cards with friends, and watching the Baltimore Orioles. She was very active in the Republican Club and Elephant Club of Washington County. She was a founding member of the Maryland Association of Election Officials (MAEO) and the Business and Professional Women (BPW). Dot is survived by 5 nieces Kendra A. Sommerfeld and her husband Dennis of Greencastle, PA; Karen M. Rivenbark and her husband Charles of Fredericksburg, VA; Krista L. Campbell and her husband Cameron of Stewartstown, PA; Kaye E. Robucci and her husband Dean of Hagerstown, MD; Stephanie J. Hilker and her husband Michael of Martinsburg, WV. Three great nieces Kara M. Geib and her husband Jeremy of Elizabethtown, PA; Kelsey L. Dunn and her husband Ryan of Rosedale, MD; Kristyn A. Sommerfeld of Greencastle, PA and her friend Chris Nilson of Clear Spring, MD; great nephew Kristofer C. Sommerfeld and his wife Amanda of Greencastle, PA. Dot is also survived by one great great nephew Cameron D. Geib and one great great niece Cassidy C. Geib both of Elizabethtown, PA; and cousins and good friends. Dot was predeceased in death by two sisters Carolyn A. Baer and Mary Lou Black. The family will receive friends at the Osborne Funeral Home 425 S. Conococheague St. Williamsport, MD on Friday, February 8, 2019 from 6:00-8:00 pm. The funeral home will be open after 9:00 am on Friday for the convenience of family and friends. A celebration of life will be held at Osborne Funeral Home 425 S. Conococheague St. Williamsport, MD on Saturday, February 9, 2019 at 10:00 am with Rev. Nancy Green officiating. Interment will be in Greenlawn Memorial Park Williamsport, MD.